Susan Andreasen studied at the Parsons School of Design in New York City to develop her talent in Fashion Design and Illustration where she had the privilege of studying with Murray Tinkleman. Susan began her career in fashion illustration at Fairchild Publications as an illustrator, moving to the Nadler & Larimer Advertising Agency as an Art Director on the Bailey’s Irish Cream account. One of her important accomplishments in this industry was featured in Ad Age Magazine. Her advertising strategy focusing on a new product, in a new way, in the US market resulted in sales of over $13.5 million in six months. 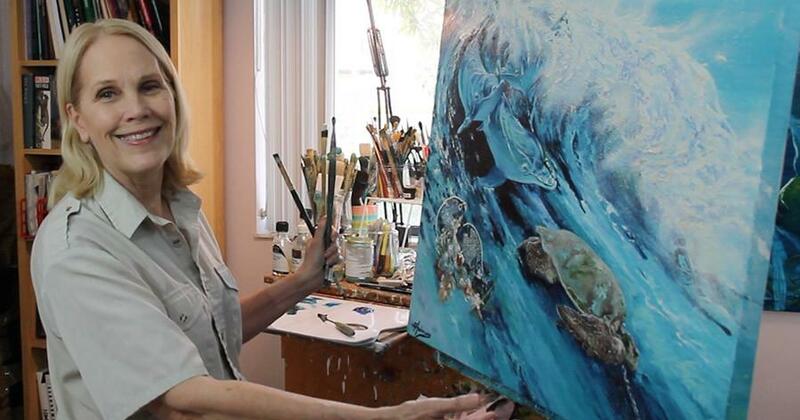 Following a distinguished career in advertising, Susan changed her professional direction to painting portraits with a unique perspective incorporating humans and endangered species. The paintings pose the question “who is endangered?” – animals or humans, or perhaps, both. Environmentalist and endangered species advocate, Andreasen, has devoted her career to promoting green consumerism and environmental awareness thorough her artwork. Based in South Florida, Susan has been involved with ecologically motivated artistry for over a decade. Her challenge is to save endangered wildlife, and ultimately, preserve the environment. A portion of Andreasen’s sales becomes a donation to an environmental or endangered species related charity. Susan’s commitment as an eco-artist resulted from concerns about endangered species and the environment after traveling over 9,987 miles on a boat for four and a half years along the Coast of the United States. Searching for wildlife, she had to travel twenty miles from shore to see whales, fish, birds and other nautical wildlife in their natural environment. Closer to shore animals fought man-made pollution and were essentially absent from view. Later, in Africa, similar experiences with other mammals showed they were clearly at risk because of poaching, habitat reduction, and other human-made incursions into their natural environment. Today Susan Andreasen is an eco-artist creating paintings with animals that are endangered or extinct situated in their environment. Her technique paints layers of oil to get the vibrant colors of nature and animals that are threatened with extinction. She is the first and only artist to combine human images, sometimes a celebrity, with an endangered species using portraiture. Since 2015, portraiture has become an increasingly important aspect of her work, using oil on canvas or linen, as well as watercolor and sculptures. Melding traditional art and nature, Susan teaches her methods to students in workshops and lectures at art centers, on campus and in museums to demonstrate that the techniques and ideas of contemporary art can be applied to the subject matter of wildlife. Susan’s teaching has raised public awareness of the needs of the environment and the reality of which animals are on the brink of extinction. Viewing all animals as art-worthy subjects, and accepting wildlife and nature art as a contemporary art form has become a very popular subject for art museums and the universal art world. Susan has been playing a very exciting role raising awareness of endangered species and humanity’s destruction of the environment through her own commissioned artworks.